Use basic Afghan stitch to crochet a potholder or trivet. 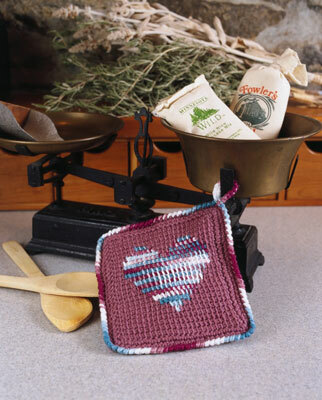 With this project, you crochet a potholder in any two contrasting colors. You first work front and back panels, add a border, and then join the two pieces. Yarn: Coats & Clark Red Heart Classic 4-ply worsted-weight yarn (100% acrylic), Article E2670 (3.5 oz. [99 gm], 198 yds. each skein for solids; 3 oz. [85 gm], 174 yds. each skein for multis): 1 skein each of #759 Cameo Rose (MC) and #972 Wedgewood (CC). Afghan hook: 10-in. Afghan crochet hook, size H-8 U.S. or size needed to obtain gauge. Hook: Standard crochet hook size H-8 U.S. or size needed to obtain gauge. This hook is for adding the edging to the piece. Measurements: 7 1/2 in. x 7 1/2 in. Gauge: Working in basic Afghan stitch with Afghan crochet hook, 4 sts and 4 rows = 1 in. 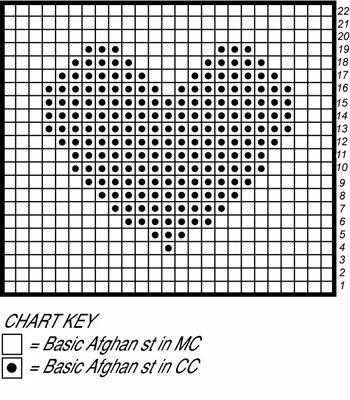 You work the back of this potholder in basic Afghan stitch following this chart. Read all rows from right to left. With Afghan crochet hook and main color (MC), ch 25. Insert hook in 2nd ch from hook, yo, draw yarn through st, insert hook in next st, yo, draw yarn through st , rep from to across, keeping all loops on hook (25 loops — first half of foundation row complete), beg 2nd half of row, yo, draw yarn through 1 loop on hook, yo, draw yarn through 2 loops on hook , rep from to across. One loop remains and counts as the first stitch of the next row. Work in basic Afghan stitch across all 25 stitches, following the chart for color changes. With MC, sl st in each vertical st across. Fasten off both colors. Work the edging with a standard crochet hook. Ch 1, working across side edge of back, sc in each row-end st across side edge to next corner, work 3 sc in next corner st, sc in each st across bottom edge to next corner, work 3 sc in next corner st , rep from to around, sl st in 1st sc to join. Work the front by repeating Step 3, but don’t fasten off MC at the end of the last row. Rnd 1 (right side): With wrong sides of front and back facing each other and top edges aligned, ch 1, working through double thickness, sc in each st across to next corner, work 3 sc in next corner st , rep from to around, sl st in first sc to join. Fasten off MC. With right side facing you, join CC in top right-hand corner sc, ch 1, working from left to right, reverse sc in each sc around, sl st in first reverse sc to join. Ch 12, sl st in corner st forming a loop, sl st in ch-12 loop just made, ch 1, work 16 sc in ch-12 loop, sl st in corner st of border. Fasten off.